in chicago, pandas walk the streets. — Lindzsays! in chicago, pandas walk the streets. in chicago, pandas walk the streets., originally uploaded by LRose17. I am preparing to "sell Chicago" to my brother this weekend when he visits me. It's not that a move is a certainty for the littlest Verstegen, but that Chicago just might entise him enough to want to move. 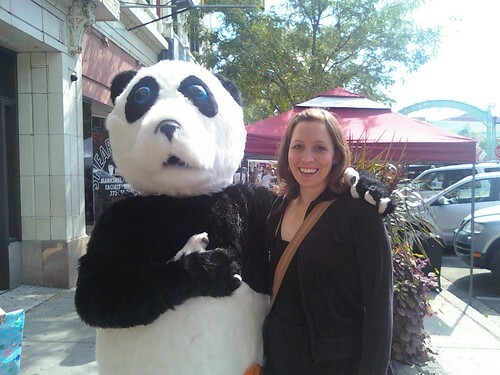 When I look at this photo of me with a panda (I ran into him on the street!) I think about the fact that Chicago offers all sorts of amazing things like pandas roaming the streets, hot dogs with lots of toppings and bike lanes! all I need...is this photo. Wherever pandas walk the streets is okay by me.